Tonight, the musical elves put on their big parade. There is lots of Christmas songs and singing. Their parade really puts everyone in the Christmas spirit! Would you like to “hear” more about the musical elves parade? The elves in the parade sing all kinds of Christmas songs. They stop along the parade route and start singing for everyone. It is a bit like carolling for elves! When they get a figgy pudding then the singing elves move on. Of course, you cannot have North Pole Christmas music without Elfis! All the elves scream when he starts to sing his hit Christmas songs like “Blue Elf Shoes”, “Sleigh Sleigh Rider” and “Elfhouse Rock”. The air guitar elves are awesome too (they had lots of practice making Guitar Hero a few years ago :-). Can you guess what instruments the elves use to play “Jingle Bells” in the parade? Can you guess who pulls the sleigh? I think the Christmas Music Parade has the best bands. They are really good! But, I must admit, I still do not know why Clumsy the Elf always wants to play a great big tuba. He can barely even lift it up it is so big! So he wobbles from one side of the parade to the other. Then he wobbles back again! All the other elves in the band started to do it too. It looked really cool (until the tuba ended up on Clumsy’s head!). It is a real pleasher to have some of your elves visit us. I want it to snow so bad. For Christmas I want eletric scooter . Can I come for the elf music parade? Just pick me up at my house! I think clumsy wannted to play the tuba because elfs talk softly and thety want to talk loud! why did you let your elfevs do such werid things????? are your elfves on the nice or naughty list? 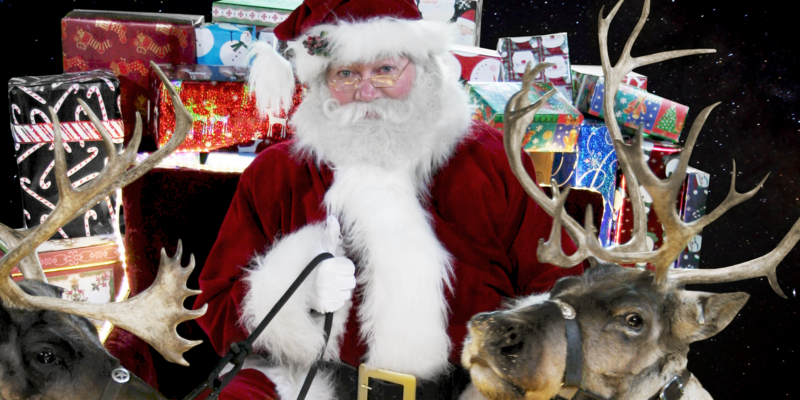 i can not belive that santa is bloging! mabye he sould try facebook. i would be his friend on there!! hope you all have a merry xmas!! i hope you can get down the chimney santa!here’s a joke: what is santa’s wife called? mary christmas! 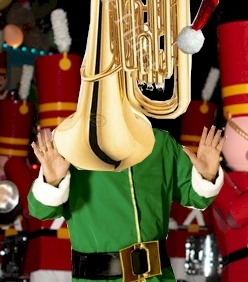 i bet the elfs play a mean tuba i mean its probebly funny to see them rocken out blowen that huge thing!!!! Hi santa i love you alot!I’m in my christmas play at church.I’m an angel.I have to wear a halo a dress and some wings.I am also in my christmas program at school.I have to sing christmas don’t be late.Well thats all i have to say bye. yes i do think clumsy looks silly in a tuba and yes i like to sin chirstmas songs. I HOP U HAVE A MERRY CHIRSTMAS AND HAPPY NEW YEAR!! clumsy looks silley in a tubu. are the parades fun. Ha ha ha!or should i say ho ho ho!I cant wait for Christmas day!thank you for everything you do! P.S.Do you have any Christmas traditions that you do every year? I wish I could go to a parade I’m not to sure if I’ve been to a parade. Anyway merry christmas to all. I love to sing, so I ecspecially love sining Christmas carols. I am actually singing a solo in a Christmas Concert for school! I bet Clumsy looked pretty silly but, it sounded like it worked out! Santa wish everyone a Merry Christmas cause they deserve it. I am definitely trying to put out a lot of Christmas Spirit! Love you soooo much! I love christmas songs they bring happiness and joy to the world.And clumssy did look a bit silly. i think he would look really funny ! clumsie is so clumsie!!!!!!!!!!! and i never new he can play the tuba. I hope you enjoy the parade! Awesome Santa. I just wanna know, in the christmas parade they have food? what kind of food? yes the elfs would look silly . CLUMSY THAT IS A NICE NAME FOR AN ELF.SANTA WHAT IS YOUR FAVORITE TYPE OF COOKIE? did Clumsy get his head stuck in his tuba?Santa keep writing those blogs i love them and they are very funny c ya at Christmas bye! Hi santa how are u what are you doing right now?? Next PostNext Christmas Knock Knock Jokes!